Dallying In The Dirt, Issue #184 --- The ground ivy has met its match. One of the grandchildren in Carp, (a small town near Ottawa,) had his sixth birthday on Thursday. We were there. That’s my explanation for writing “Dallying” on Sunday night instead of the usual Friday morning. Some things in life are just more important. I spend most of my days trying hard to get things to live and grow but this week I’m excited about something that I actually seemed to have killed. Glechoma hederacae is my sworn enemy. You may know it as Ground Ivy or Creeping Charlie or a variety of other common names and it is a very common weed in lawns. I don’t have much lawn but the little bit that exists has always been filled with this lovely? blue flowered vine. Before most selective herbicides were banned here, I had tried them all to very little effect. Ripping and pulling helps momentarily but actually just propagates the stuff. It also runs very quickly into the garden beds beside the bit of lawn. Cutting your grass high, 2.5" - 3" and keeping it well fertilized are things that the grass likes and the Glechoma does not. This past week I found a better and much simpler answer. The nasty stuff is very sensitive to Boron. The old fashioned laundry additive Borax is a Boron derivative. 1 teaspoon in a cup of water over 5 sq. 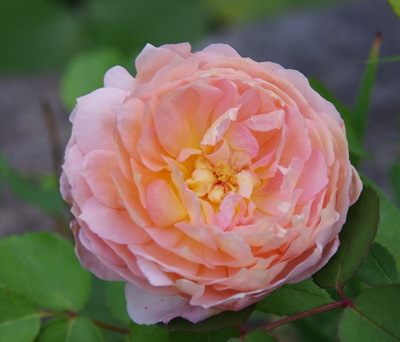 ft. (multiply that to whatever area you are working with,) applied with a coarse sprayer or a fine watering can rose, was the suggested recipe. 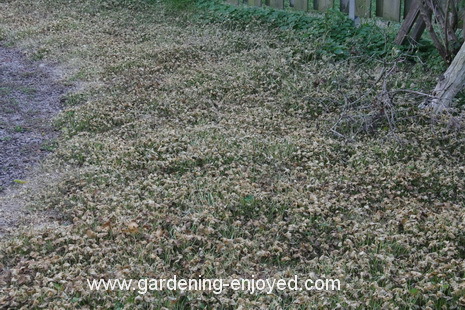 In just a few days I was doing my happy dance over my test area of live grass and dead ground Ivy. Simple, cheap, effective, why didn’t I learn about this years ago. Here’s another plant that has died this week but it’s a good thing. The large terra cotta pot, planted with Potatoes has been voraciously consuming water and fertilizer for the past few weeks. It had started to wither as we were leaving and I found it totally dead upon our return. Not only, do I not have to water it any more but tomorrow I can dump it out and see how many potatoes it managed to produce this year. French Fingerling is the variety that performs best in a container and the record for this particular pot is about 6.8 kg. (15 lbs.) I will dump it out into the wheelbarrow tomorrow and see how well they did this year. Once I’ve done that I will have to start wandering the garden looking for space. There was a nice cardboard box on the porch when we returned and I was excited to see that it was from Chuck Chapman Iris. Chuck had sent me a note asking for more varieties for my wish list because he couldn’t supply all of the ones I had requested. I thought I might find room for 7 or 8 so I naturally ordered 12 and the box contained 16. I do grow a few too many vegetables so that space may have to shrink. Now to check out his web site to see what all of the extras look like so that I know what to spend 10 months anticipating. The wonderful people at David Austin Roses continue to send me new and different varieties to trial. I have had some success with them but they always seemed a bit weak stemmed and they did not rebloom very well. At a Garden Writer’s conference I spent some time talking to their representatives about my concerns. I did feel a little stupid when he asked me about my fertilizer regimen. Upon admitting that I was very lax about such things, he very gently suggested that I should at least attempt to follow their published guidelines. I was much better this year and amazingly, despite the severe winter die back, they grew much stronger and they have continued to bloom throughout the summer. 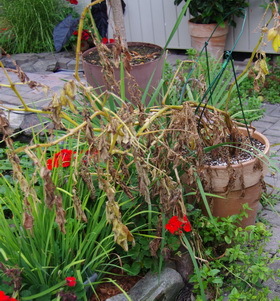 Carding Mill, the one in the picture, had performed quite well all year despite being confined to small growing space. One of the new ones this year, Gentle Hermoine, with the help of a little fertilizer, has grown very well and bloomed continuously. Amazing isn’t it! Dan Asks? I am considering modifying my landscaping Two questions regarding Boxwoods. 1. Is it to late in the season to plant Boxwoods. 2. The location I am working in is sucesptible to road salt. How well do Boxwoods tolerate salt. Ken Answers! It is not too late to plant some Boxwoods but they would probably suffer if subjected to road salt.